In food processor, mix goat cheese, spinach and seasonings until smooth. Place a wonton on work surface with points at 12, 3, 6 and 9 o'clock. Put 2 teaspoons of filling in center of bottom half of wonton. Brush edges with water and fold top over to form a triangle. Seal edges. Repeat with remaining filling. Fry wontons in hot oil until golden, about 1 minute on each side. Do not crowd fryer. Transfer fried wontons to a wire rack set over a shallow baking pan. Fried wontons may be held in 200°F oven while remainder are fried. Serve with Tomato Salsa. heat until liquid has evaporated. Serve either warm or chilled. 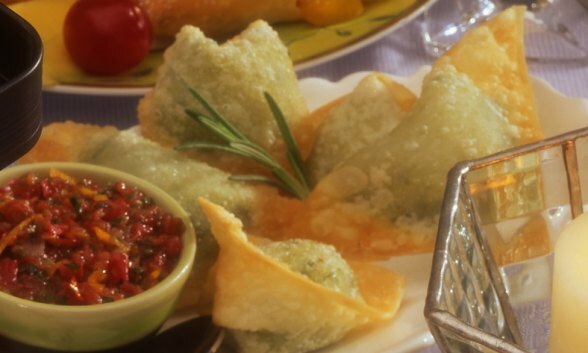 To keep fried wontons warm while frying the remaining batches, place them on a baking pan in an oven preheated to 200°. You will need 2 tablespoons of tomato paste for the pulled pork and 1/2 cup for the empanada filling. Buy a 6-ounce can of tomato paste.